Sometimes my dial-up internet service works fairly well. Sometimes it doesn't. Lately, it hasn't. Sometimes my 60-year-old body works fairly well. Sometimes it doesn't. Lately, it hasn't. Between the two, I've been doing things in slow motion lately, really slow motion. But, on the bright side, any motion is better than no motion! 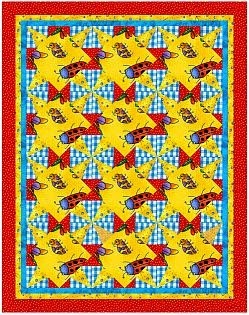 While I've been trudging along at snail speed, volume 11 of Quiltmaker's 100 Blocks came out. 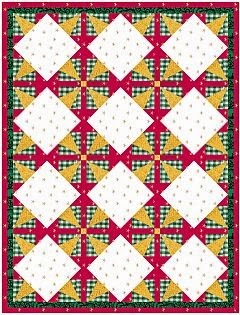 If you look on page 36, you'll see "All Wrapped Up," a block that I designed for using those large prints that are too beautiful to cut up into little squares and triangles. 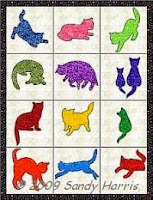 It's a little difficult to see the focal fabric in a small photo, but it features a calico cat and two kittens. 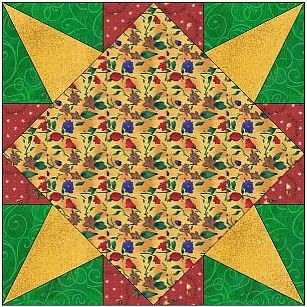 When I first designed the block, I happened to have Christmas fabrics in my EQ fabric palette and used a few to color the block. The result reminded me of a Christmas present tied with ribbon, so I named the block All Wrapped Up. 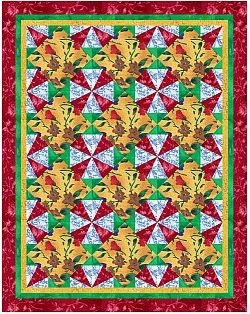 As a runner, the block design loses the pinwheel and circular effects, but it's still quite a striking design for showing off a beautiful print or a beautiful quilting design. Adding sashing makes the design look a bit like a complex plaid. I think I like it best set without sashing. But then again, some fabrics might look best with the sashing. Which way is your favorite?